Timetraveller™ is a love story. It’s a piece of science fiction. It’s a history of colonialism and Indigenous resistance. But of all these things Timetraveller™ is a story about media and remediation. This is not to say that the work is more of an aesthetic than political piece. It is to say, however, that the import of Skawennati’s politics is realized through the refashioning of “old media” in the new. Skawennati’s engagement with new media extends into her early career. In 1997 she curated and launched CyberPowWow, the first interactive, online Indigenous art gallery. 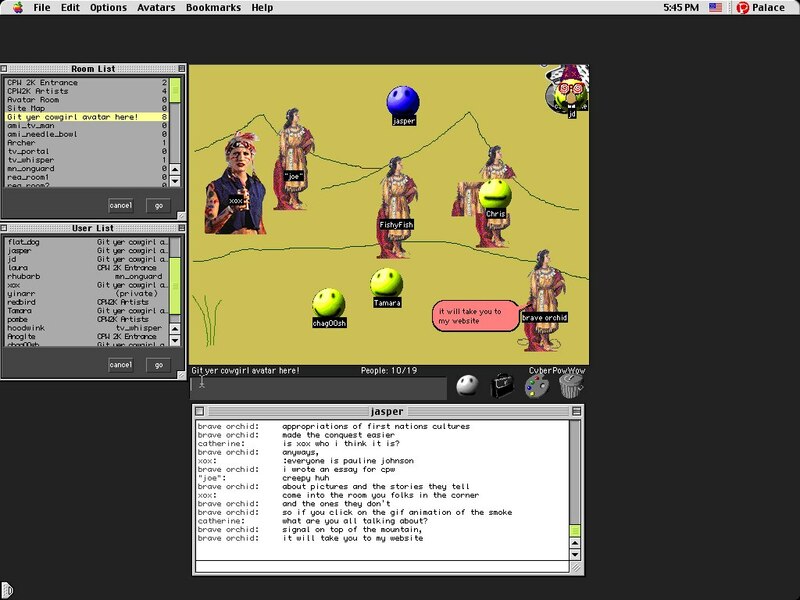 CyberPowWow was built in the Palace, pioneering software that provided access to chat rooms where users interacted via graphical avatars. CyberPowWow: CPW 2K. Room title: “Git yer cowgirl avatar here!” by Marilyn Burgess. In many ways Timetraveller™ is an extension of CyberPowWow. Promoted as “a website from the future discovered by Skawennati,” Timetraveller™ follows Ratorats “Hunter” Dearhouse, a Kanien’kehaka bounty hunter, through nine linked episodes. Each episode revolves around a futuristic gaming system called Timetraveller™: a virtual reality (VR) platform that compiles Internet data to render detailed, and interactive, representations of the past and the future. The subjects of media and “entertainment” are at the core of Timetraveller.™ In Episode 01 Hunter sets his VR headset to travel back in time to Fort Calgary, Canada. The year is 1875 A.D. He arrives just as a group of colonialists are finding their seats: “It looks like there’s going to be a show,” Hunter remarks. Indeed, in his engagement with his own “new media,” the Timetraveller™ VR, Hunter inadvertently stumbles across the “new media” of the 19th century, a moving panorama. One hundred and fifty years ago the moving panorama was one of the most popular forms of entertainment in the world. Hundreds of them toured Europe, the United States and Canada. Moving panoramas were composed of a series of contiguous scenes that scrolled past an audience behind a proscenium, which hid the machinery and the man turning the crank. Kerosene lanterns illuminated the “moving pictures,” while a “Delineator” provided the story. The moving panorama in Timetraveller™ contextualizes Hunter’s VR and locates Skawennati’s piece itself within a layered history of “new media.” Skawennati brings to life Hunter’s interface via a medium as novel to the 21st century as the panorama was to the 19th: machinima, an animated movie that uses computer or video game software to generate the characters and scenes. 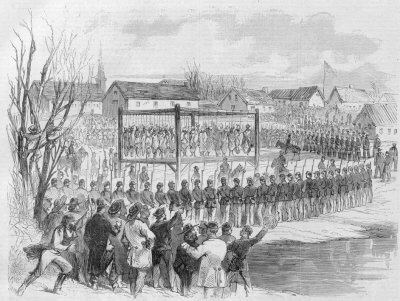 Then, through both her own medium, and the one she imagines for Hunter, Skawennati reimagines and refashions the “Minnesota Massacre,” panorama (1863) in her own narrative. This process of incorporating representations of past and future media technology into present day platforms is known in media studies as “remediation.” “The goal of remediation,” Jay Bolter and Richard Grusin argue, “is to refashion or rehabilitate other media.” Remediation is also the way in which people engage with new media technologies through their familiarity and use of old media. By incorporating the moving panorama, Skawennati thus generates a genealogy of both Hunter’s imagined interface and her machinima while reclaiming the narrative that “Minnesota Massacre” attempts to propagate. The “Minnesota Massacre” itself is a series of forty-five 42 x 42 panels depicting the 1862 “Sioux uprising” in southern Minnesota, which ended in the largest single-day execution in American history. In its “grossly offensive depiction of the Sioux” as savage warriors preying on defenseless settlers, “Minnesota Massacre” was an effective propaganda tool for the burgeoning settler state, instrumental in the colonial dehumanization of Indigenous peoples and serving as retroactive validation for racialized violence. According to Kristen Dowell, visual sovereignty is “the articulation of Aboriginal peoples’ distinctive cultural traditions, political status, and collective identities through aesthetic and cinematic means.” Skawennati takes up visual sovereignty by refashioning colonial media in Indigenous contexts, thereby loosening the tight grip that colonialism has on popular media and generating space for Indigenous voices to circulate around and even within them. Indeed, the “Minnesota Massacre” is the catalyst for Episode 02 of Timetraveller™. 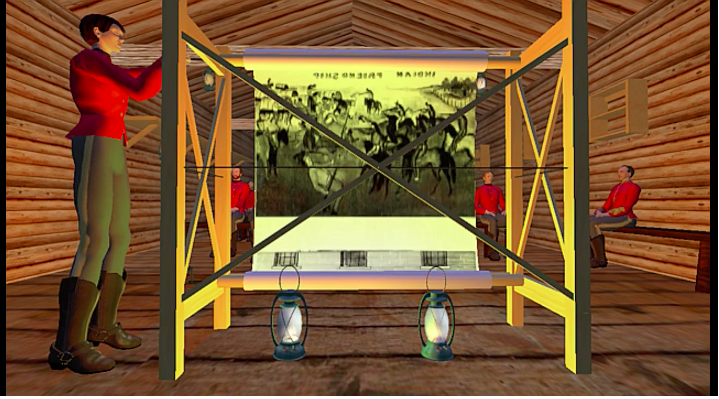 After watching the panorama and noting the influence it has on its white audience, Hunter states, “If there’s one thing every Indian knows, it’s this: when it comes to history, always get a second opinion.” Typing the coordinates into his VR, Hunter then transports himself from 1875 to the period and place represented in the panorama. Significant also is that rather than engaging with the scene from “fly-on-the-wall mode,” as he does in Episode 01, Hunter switches his display to “Intelligent Agent,” thereby allowing his character to interact with the Sioux characters and to participate in the action. In this sense, by putting her protagonist in charge of the action, Skawennati asserts cultural self-determination and salvages the “screen” to tell Indigenous histories from Indigenous points of view. The racist narrative of “Minnesota Massacre” is recuperated into both Skawennati and Hunter’s media and that history is re-contextualized within Indigenous politics, history, and storytelling. Like CyberPowWow before it, Timetraveller enacts visual sovereignty in the way that it inscribes Indigenous politics, identities, voices, and perspectives into the present, past, and future of screen culture, a medium that has historically worked to efface Indigenous presence. In engaging the past Timetraveller™ re-positions Indigenous presence and future and imagines new spaces to create and share stories. Timetraveller™ is a love story, a sci-fi romp, and an experiment in narrative form. It is an account of colonialism and resistance and a projection of forthcoming realities. Timetraveller™ is a story about the history of Indigenous presence, but it is also a story about the future of Indigenous histories. Join Hunter, Skawennati and the Dunlop Gallery in this unique opportunity to travel back to the future. Originally published in the Dunlop Gallery Program Guide, November 2015.